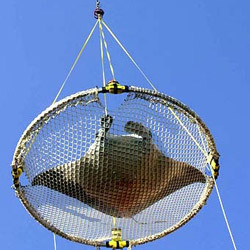 Zeus is a 980lbs giant manta ray that was living happily at an Atlantis resort as part of a research and release program was released to the ocean the other day. Here's a picture of mighty Zeus. 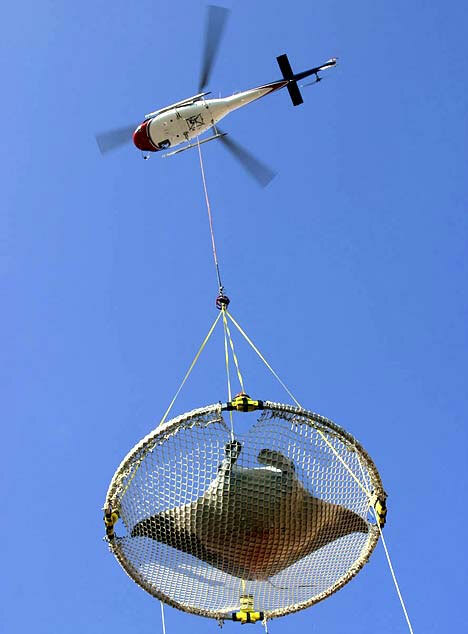 About 13ft in diameter, they had to transport him via helicopter to the ocean. He spent 3 happy years as a tourist attraction but is now free to roam the ocean. Marine biologist will monitor his condition and movement via a tracking device to make sure Zeus is okay! I am so glad I went to Atlantis and saw Zeus last summer in 2007 and have pictures of him. He is so beautiful and I hope he does ok in the wild it was a wonderful to see him being released on the today show it brought tears to my eyes! yea..i think if your profile is private, nobody can access the pictures? that would be interesting to see! How long was he outta the water for? That picture is crazy! Thanks for sharing; I hadn’t heard about this. I am saddened to see animals removed from their natural habitat to be used for the pleasure of man. I will “never” visit Atlantis for that very reason. Wow, I just stumbled across this image from Bing and I too am happy that I was able to see Zeus in 2007. That guy was HUGE! My girlfriend and I have beed talking about him ever since we saw him. I think I have a video of him swimming around the Atlantis. Hope he does well. Anita really stay home— you will be safe . Are you really that close minded –you probably cant afford the trip. wow.